Azadi / Freedom comprises of two works inspired by primary research findings, specifically, a face-to-face interview with Asif, an Afghan refugee who has resettled in Edinburg, in collaboration with COLOURSedinburgh. The work was exhibited and auctioned as part of ongoing efforts to illustrate the stories, views, emotions and ambitions, and lend support to refugees living in Scotland. Read more about the exhibition and view other works here. 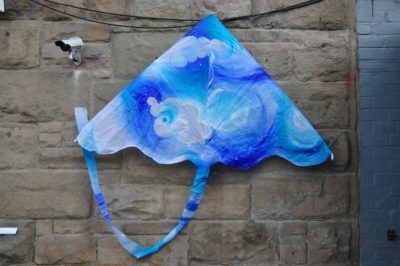 The work, named ‘Azadi’, or ‘freedom’, in persian, was embodied in the form of a handpainted kite and corresponding kite tattoo design, paying reference to the national sport of kite-flying, which has been banned in Afghanistan since the Taliban regime took over.